This new legislation sets the territory on a path to save 30% of electricity by 2040 and to meet 100% of its supply with renewable energy by 2050. It also supports other building blocks for energy efficiency, including a lead-by-example requirement in government buildings, efficiency’s inclusion in future utility system planning, and performance-based regulation that aligns utility incentives with expansion of efficiency and other clean resources. When implemented, this legislation will represent a massive step forward for the territory, where energy efficiency programs have lagged behind other parts of the United States, and where renewables represented only 2% of the territory’s electricity supply in Fiscal Year 2017. 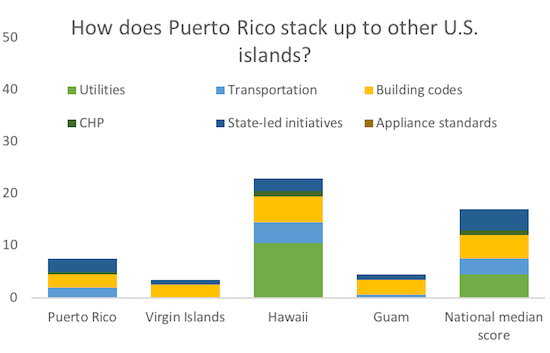 As of the 2017 ACEEE State Scorecard, the Puerto Rico Electric Power Authority (PREPA), the territory’s utility, did not offer meaningful efficiency programs to its customers, and it lacked regulatory mechanisms to incentivize efficiency investments. Puerto Rico is heavily dependent on expensive oil for more than three-quarters of its energy needs, and its vulnerable transmission and distribution system forces reliance on expensive diesel generators after storms. These factors have led to high electricity rates, without the efficiency programs needed to mitigate the impact on customer bills. Hawaii grapples with even higher energy prices, but is already successfully implementing a similar energy efficiency standard, aiming to use efficiency to meet 30% of energy needs in 2030. After Hurricanes Irma and Maria caused devastating damage to Puerto Rico’s electrical grid in 2017, a bipartisan group of legislators came together to articulate a new vision for the territory’s energy system. That vision focused on a pathway towards a self-sufficient, clean, distributed energy future, supported by energy efficiency and strong integrated resource planning. The legislators also recommended adoption of a modern performance-based regulatory framework that encourages efficiency for all energy sector participants. The pending legislation largely adopts the collaborative’s vision, setting up a robust framework for transforming the territory’s energy system. But setting a goal is not enough — the next step is implementation. The legislation requires that the regulator, the Puerto Rico Energy Bureau (PREB), issue a regulation within 180 days that establishes the mechanisms for meeting the territory’s energy efficiency goal. The bill also enhances PREB’s ability to set and enforce these regulations. PREB is already exercising that authority in service of clean energy and resilience. A few weeks ago, the regulator rejected a PREPA integrated resource plan that conflicted with the policies in this new legislation, requiring the utility to resubmit a new, more robust plan. As the regulator seeks to measure and meet these standards, it faces some of the same questions encountered by the 27 states across the United States with an EERS. Last year, New Jersey and Virginia added new energy efficiency savings and spending targets respectively, while Arkansas and New York expanded their existing targets. Each of these states is now in the process of implementing those regulations, with program administrators proposing plans for meeting new targets. New Jersey is considering similar questions about how to best administer its energy efficiency programs after the legislature set ambitious savings targets for electricity and natural gas. ACEEE and other experts and stakeholders submitted comments highlighting best practices. With a renewed commitment to energy efficiency, the promise of a new energy future is on the horizon in Puerto Rico. Under the new legislation, it is slated to join New York, New Jersey, Arkansas, and others in implementing new or expanded energy efficiency targets in coming months. These upgrades are projected to make Puerto Rico’s grid more sustainable and resilient so the territory will be better prepared for the future.